Kitty looks like chuck Norris!!! lol but... wait, Chuck Norris never bleed!! Blasphemy has never been more adorable! This ain`t no Jesus this is Chuck Norris! 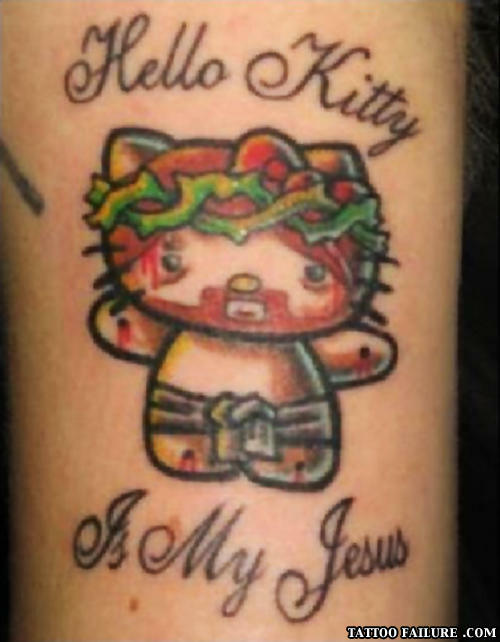 I can't stand Hello Kitty, but it's an amusing tattoo that's for sure. ... because who doesn't want to see Hello Kitty with bleeding holes in him? this is not fail. this is win. I don't get this, why is this tattoo on failures? It's awesome!! How many dinosaurs does it take to screw in a light bulb?